Secret Watermelon Rind Recipe finally! The recipe is still stored in an old, red recipe box that I gave to my mother, Chloe, when I was a child. The paper is faded and creased; but it is just as I remember it. When I was in college I used to visit friends in Currituck County, near the Outer Banks of North Carolina, and it was there that I met Miss Zulim Snow. Miss Zulim ran a country store where she sold many local goodies, including pickles, jams and jellies that she made. 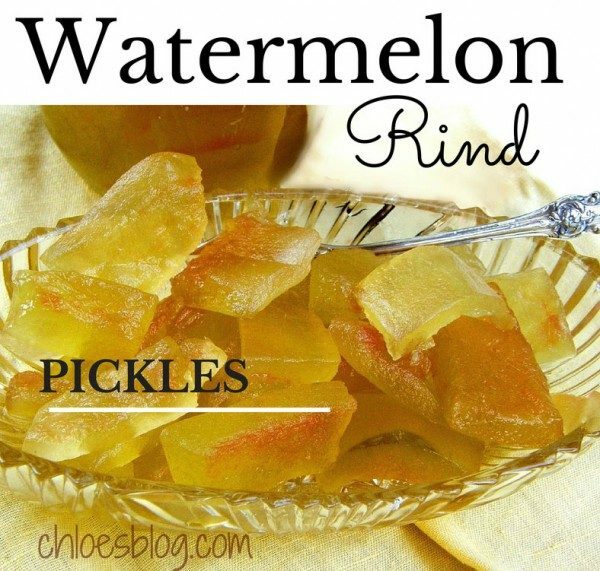 Her Watermelon Rind Pickles were like none I had ever eaten. I asked Miss Zulim for her recipe. She gave it to me with one condition: I had to promise that as long as she was living I would never share this recipe with anyone else. Mother and I made these pickles for years, always wondering if Miss Zulim was still alive. And she did live a long time. Keeping my promise, Mother and I never gave away the recipe. If folks asked, rather than disappoint them, Mother would make them a batch of pickles right here in the same kitchen where I do all the baking and preparing for the B&B guests. We even sent a batch of these tasty pickles to Riverside Drive in Manhattan. Miss Zulim is no longer with us. This is the first time I have offered to share her recipe, so you all are special. I had to eat a lot of watermelons to get all this rind! 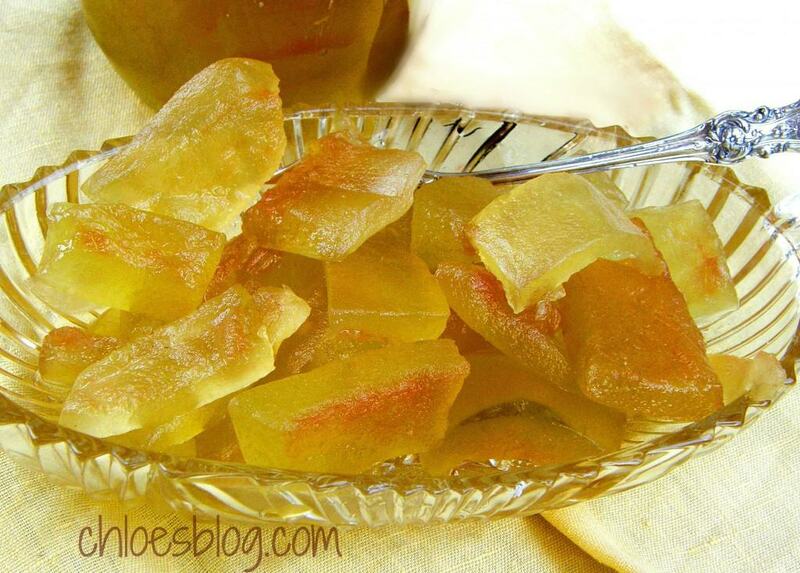 And I wanted to see if I still remembered how to make these wonderful pickles. Thank you, Miss Zulim. 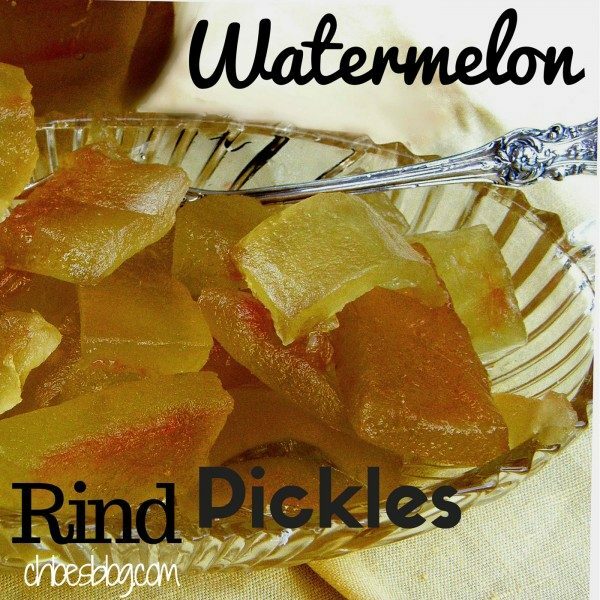 • 9 pounds of watermelon rind, the light green part (9 pounds fills a 10 quart bucket) All watermelons are not the same, so I cannot even guess how many watermelons it takes to make this recipe. I do know that you can save the rinds in the refrigerator for a few days until you get enough. Peel the rind and remove any of the red watermelon from the rind. • 4/10 of an ounce of slaked Lily lime (found at the pharmacy). It is called calcium hydroxide and you may have to ask the pharmacist to find it for you. It is expensive. Do not substitute. Wash and sterilize 10 pint jars or 20 half-pint jars. Cut peeled rind into fairly large pieces. In a glass, enamel or stainless steel container, stir the lime into 1 gallon of water. Add the rinds; they should be barely covered with water. You may have to add more water. Soak overnight. The next day, rinse the watermelon pieces in 3 or 4 washings of clear water, changing the water each time. Put the rinds into a large cooking pot and just barely cover with water. Cook gently for two hours or until the rinds are tender. Remove from heat and cool slightly. Drain rinds and immediately dunk into cold water. Chop rinds into smaller (2-inch) pieces and pack in ice for 1 ½ hours. Put 9 pounds of sugar and 3 cups water into a large cooking pot. Stir over low heat until dissolved. Tie spices in a spice bag made of two thicknesses of cheese cloth and add to the sugar solution. Remove the rinds from the ice, drain and add to the large pot with spices and the dissolved sugar. Cook on medium-low for 1 hour. Add 1 quart white vinegar and cook for 30 minutes more. Pack rinds in sterilized jars, filling with the liquid. Seal jars according to canning directions. Yield: 9-10 pints, plus samples all along.